The content on this blog was recently moved from its original domain, NetMarketingForNewbies, purchased 11 years ago. It was suggested that I consolidate my various websites into one location, so here you go! 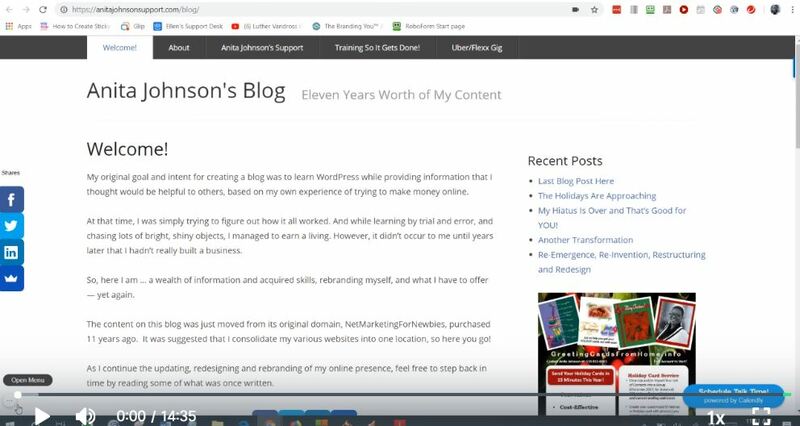 My original goal and intent for creating a blog was to learn WordPress while providing information that I thought would be helpful to others, based on my own experience of trying to make money online. At that time, I was simply trying to figure out how it all worked. And while learning by trial and error, and chasing lots of bright, shiny objects, I managed to earn a living. However, it didn’t occur to me until years later that I hadn’t really built a business. So, here I am … a wealth of information and acquired skills, rebranding myself, and what I have to offer — yet again. Please take some time to watch the video below to learn more about My Businesses today. As I continue updating, redesigning and rebranding my online presence, feel free to read my recent writings, as well as step back in time to read what was once written.